Jimmy Nunez announced all in on the button and Palma folded his option from the small blind. Apostolico snap called from the big blind and we were off to the river. "You're good in this spot!" Palma shouted in Nunez's direction, but that would not be the case as the board ran out [6h][6d][6s][7h][2h] and Nunez was sent home in 3rd place. Jimmy Nunez raised the button to 110,000 only to see Apostolico push his remaining 368,000 chips into the middle. "Ahhh, only cause i'm tired" exclaimed Nunez as he slid chips into the middle for a call. "Just a bad ace" said Apostolico. "That's what I was hoping for." The flop would be a sweat as the dealer spread [2d][9c][7h] and Nunez picked up an open ended straight draw as Apostolico paired his 7. The board ran out [4h][Qs] and Apostolico would double up. Blind vs blind Nunez found himself all in and at risk again against Nick Palma. The board ran out [Jh][7c][4h][5c][2c] and Nunez would run down Palma yet again for a double. There are 13 minutes left in level 26. On a board reading [Jd][5d][7c] Nick Palma led into Domenic Apostolico for 60,000. Apostolico responded with a raise to 150,000 which in return led to a four-bet from Palma to 305,000. Apostolico would call and the dealer burned and turned the [2h]. Palma quickly cut out a bet of 365,000 and Apostolico knuckled the table and released his cards into the muck. 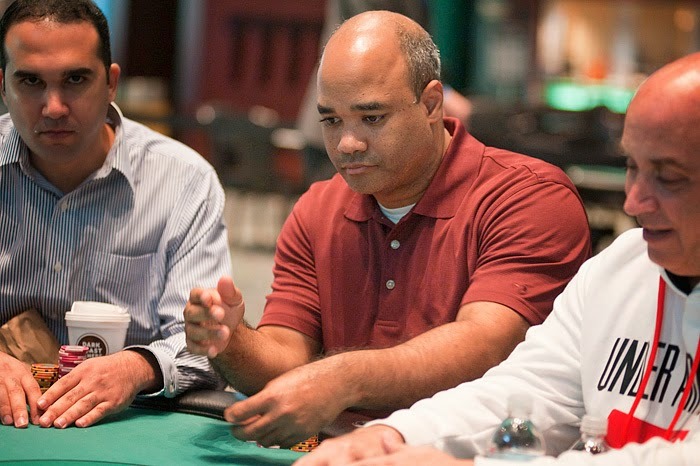 Action folded to Jerry Nunez in the small blind who announced all-in for his last 453,000. Nick Palma asked for a count and eventually cut out enough chips for a call and pushed them across the betting line. The board ran out [9h][5s][6s][Ac][Qh] and Nunez doubled up to over 900,000. The action has again slowed down. 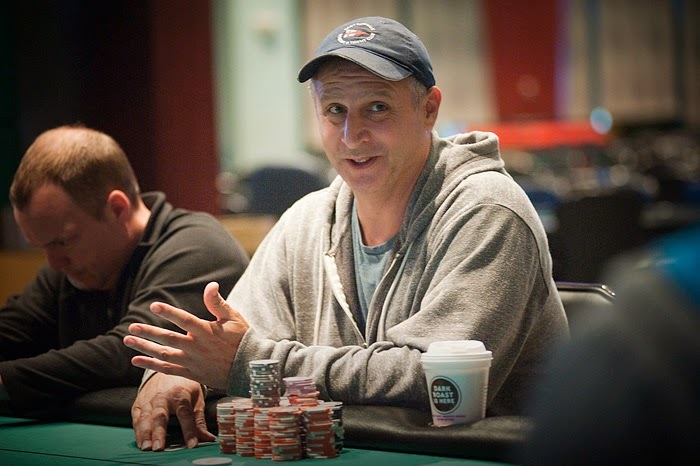 Majority of the pots have been taken down pre-flop with a raise although Domenic Apostolico is becoming more and more active ever since he doubled up. He has been using majority of his aggression with three-bets from the blinds which to this point, have gone uncontested. On a board reading [Qh][9h][7s][8h][6c] Nick Palma pushed forward a stack of green chips big enough to put Domenic Apostolico all-in. "Really?" Domenic questioned as he leaned back in his chair pondering what to do. After a few moments of thinking he said call. Palma knuckled the table. "You win, nice hand" Palma said as he tossed his cards into the muck. Apostolico tabled [Kh][10d] for a rivered straight and would double up to take the chip lead. On the very next hand Jerry Nunez was all in and at risk holding [Ad][7d] against the [Jd][9d] of Nick Palma. Palma turned towards Nunez with a smile "Good luck buddy." "I'm going to need it against you" Nunez chuckled. Event 12: Level Up with Updated Chip Counts! After a series of uncontested pots, we have reached level 25 in event 12! The blinds are now 12,000/24,000 with a 3,000 ante. Action folded to James Frangoulidis in the small blind and he pushed his last 180,000 into the middle and announced all in. Domenic Apostolico snap called from the big blind and the hands were tabled. The board ran out [Qs][4h][10d][5d][9s] and Frangoulidis was sent home in 4th place, good for $15,063. 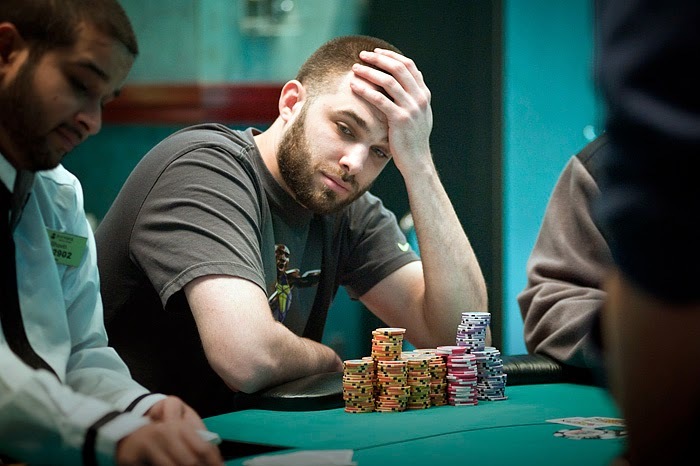 On a board reading [Jh][Js][2s][8s] Dan Chalifour checked his option to Nick Palma, who pushed in a bet of 100,000. Before the chips even crossed the bet line Chalifour announced all in and Palma snap called. It would appear Palma had run down another player at the table but would still have to fade a few cards on the river as he turned a flush with [Ks][4s] against the [Jd][5c] of Chalifour. The [3c] on the river would not fill up Chalifour and he is sent to the rail in 5th place with a nice pay day of $11,428. Nick Palma opened the action to 35,000 on the button and was immediately three-bet by Dan Chalifour from the small blind to 100,000. James Frangoulidis folded from the big blind and action was back on Palma. He wasted little time in pushing out two stacks of red for a four-bet to 235,000. Chalifour quickly called and they were heads up to the flop. Both players opted to check and would see the [Ac] on the turn. Chalifour again checked but Palma would not be giving any more free cards. He put out a bet of 130,000 and was quickly called. The river was the [4s] and Chalifour would check one last time. Palma announced all-in and Chalifour was visibly frustrated. He dropped the chips he was shuffling in his hand and sat back in his chair trying to review the action in the hand. After a few minutes he asked Palma if he would show if he folded and Palma said yes. After another minute or so he released his cards into the muck and Palma tabled the [Qd][Qs] good for a flopped top set. Palma now sits on over 1,300,000 chips as he takes a commanding chip lead over the rest of the table. Moments after Muhammad Rahim's [Ad][As] was cracked by the [Kd][Kh] of Domenic Apostolico, Rahim was all in and at risk with [As][10s] against the [Ah][Kd] of Nick Palma. The board ran out clean and Muhammad Rahim was sent packing in 6th place. He would not go home empty handed, as he takes home $9,350 for his efforts. 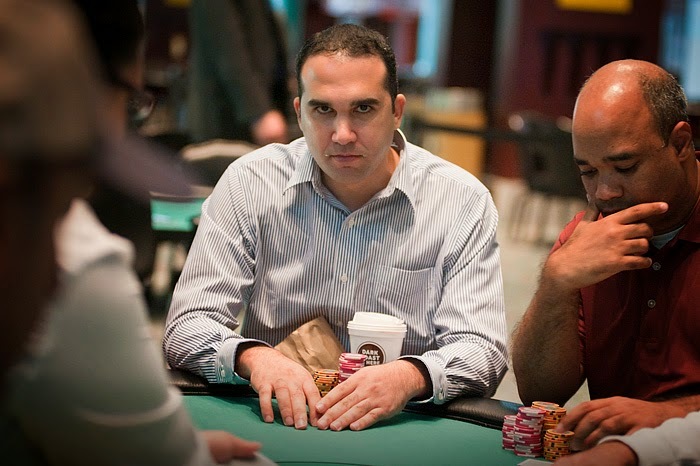 Event 12: "I Told You That You'd Get Hurt Trying to Play Against Me"
In what is starting to develop into a very interesting dynamic, Nick Palma and Muhammad Rahim have been verbally sparring with eachother the entire final table. In the latest development the board read [Qd][Qs][2c][3d][Jc] and Muhammad checked his option over to Palma. Palma slid out a tower of red chips totaling out to 125,000. Muhammad thought about it for a minute or so before announcing a call. Palma quickly tabled [Qh][Jh] for a full house as Muhammad threw his [As][Js] into the muck. "I told you that you'd get hurt trying to play against me" said Palma. "You got lucky man" Muhammad said back to him. Palma now sits on around 800,000 while Muhammad has dropped down to 400,000. 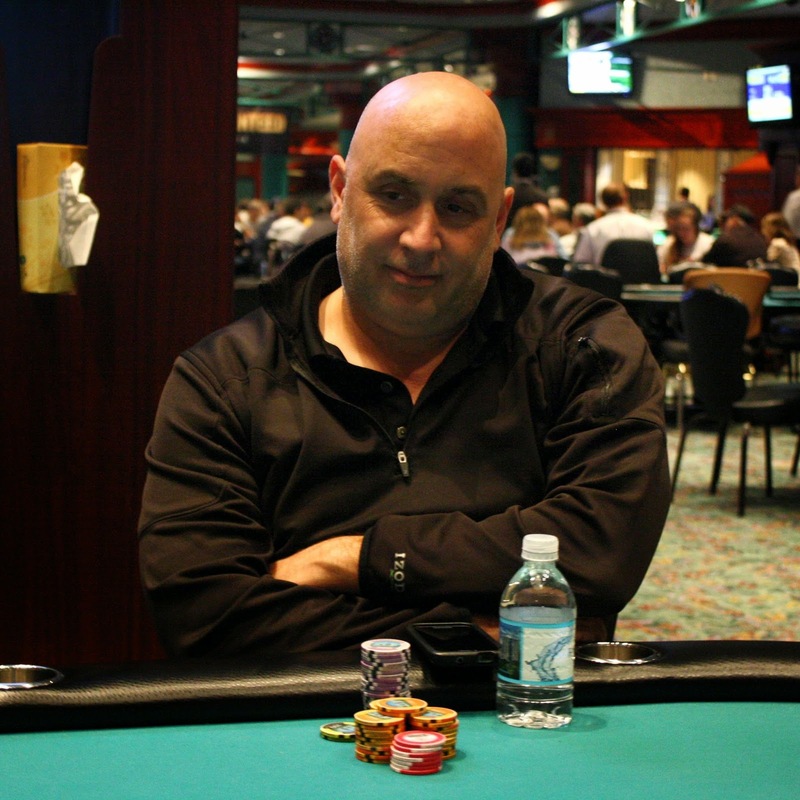 Play is done for the night in Event 13 and leading the way is no other than Ralph Macri. Macri will take home an additional $1,000 bonus for bagging the most chips.Flight 1b will start tomorrow morning at 11am! 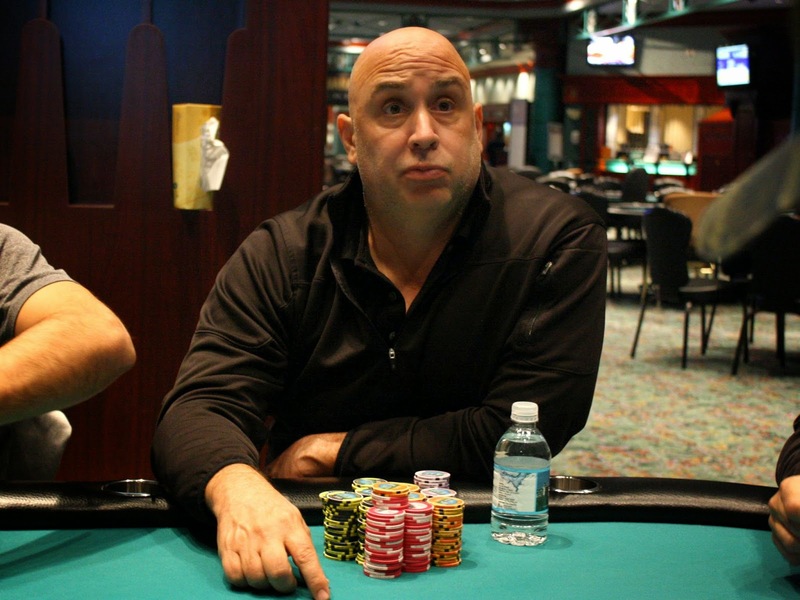 We say goodbye to Joe Tieri in 6th place, good for $7,618. The remaining players have locked up $9,350 and are all a step closer to taking down the top prize of $46,403. Moments after doubling up Dominic Apostolico, Bobby Ricciuti was all in and at risk for his last 60,000. Bobby would need to win the flip to stay alive and it seemed like he might when the dealer spread the [9h] [Kc] [4h] flop. Unfortunately for Bobby the turn was the [Qs] and he would not improve on the [4s] river. Ricciuti will collect $6,060 for his 8th place finish. The clock reads 35:00 remaining on day 1a of the $400 Event 13. Players will bag chips at the end of this level to return for day 2 on Tuesday at 11am. The chip leader of this flight will also take home a $1,000 bonus at the end of tonight, and the second biggest stack will pocket an additional $500. The final 8 players are now back from dinner and ready to play down to a winner. The blinds will be 6,000/1,200 with a 2,000 ante. Who will walk away with $46,403 and the Foxwoods globe? Players are now on their 60 minute dinner break. Play will resume at 7:02pm. Action folded around to Nunez in the cut-off and he elected to raise to 26,000. Bobby Ricciuti announced all in on the button for his last 110,000 only to see Nick Palma slide a stack of chips into the middle announcing he was all in. Nunez buried his face into his hands but eventually would fold and the two hands were tabled. The board ran out [6s] [9d] [9h] [4s] [7s] and Ricciuti would double up to over 260,000. 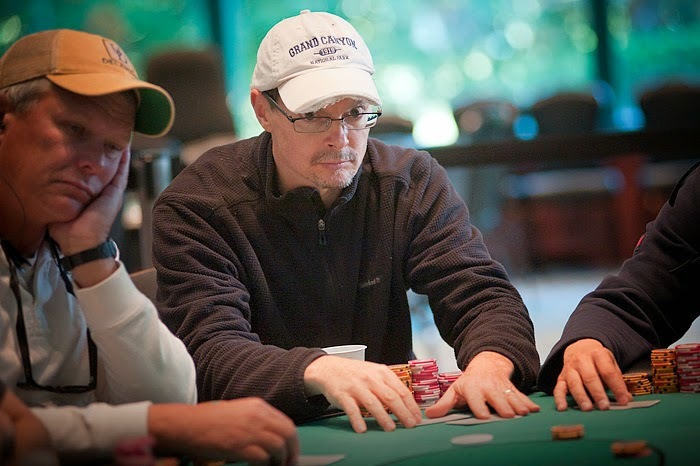 Charles Townsend slid his last 66,000 into the middle from middle position announcing all in. Action folded around to Jimmy Nunez in the big blind who snap called. "I only looked at one!" Towensend said with a smile. He rolled over [Kh] [Js] and was in bad shape against the [Qd] [Qs] of Nunez. The board ran out clean and Towensend was sent home in 9th place. 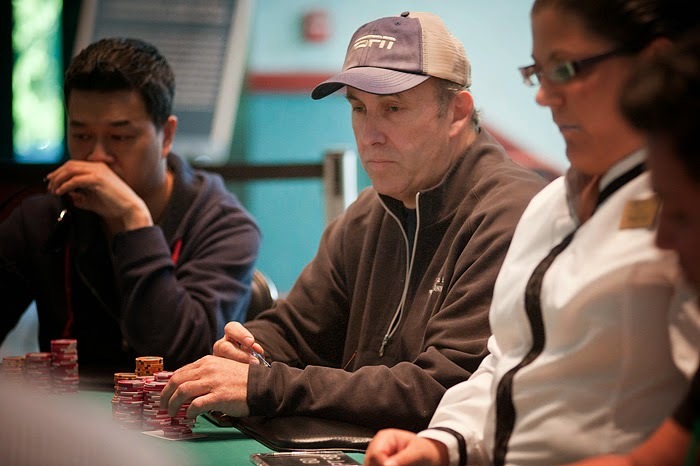 Towensend will take home $4,851 for his 9th place finish in Event 12. The remaining 8 players are guaranteed at least $6,060. Players will be on a 60 minute dinner break at the end of this level. The players in Event 13 are now coming back from their last break of the night. There are currently 45 players remaining from the 125 players that started the day. They will play two more levels. We say goodbye to She Lok Wong in 10th place. 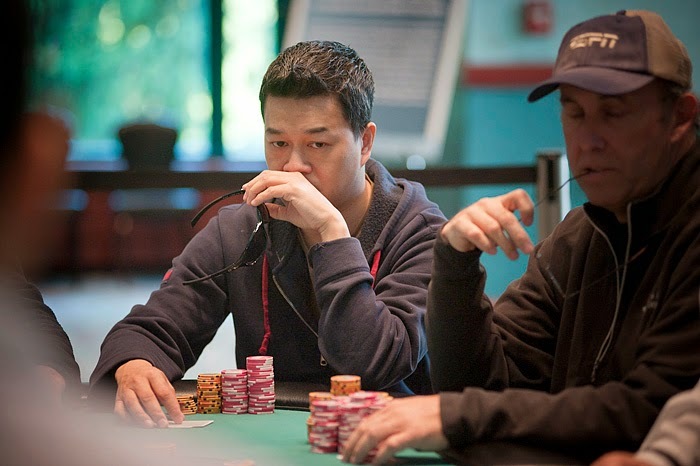 Wong will take home $3,809 for finishing 10th in the $1650 Event 12. The remaining 9 players are guaranteed at least $4,851. 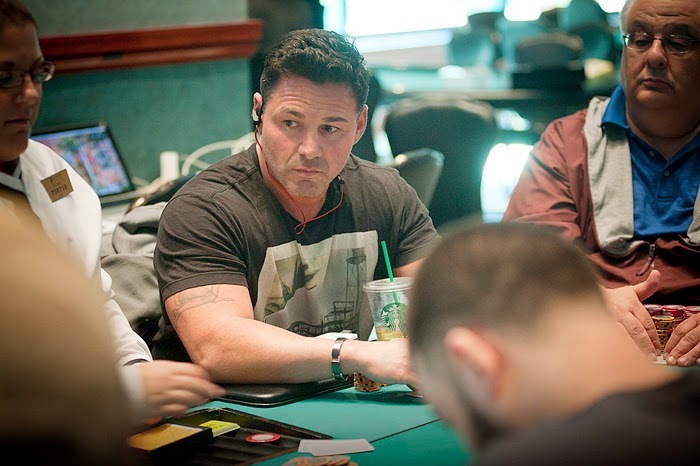 Bobby Ricciuti opened the action with a raise under the gun +1 to 17,000 only to be called by Joe Tieri, She Lok Wong, and Dominic Apostolico also called from the small blind. Muhammad Rahim announced he was all-in from the big bling for an additional 121,000. Bobby and Joe got out of the way but She Lok Wong wasn't going anywhere. He counted out a call and slid the chips forward as Dominic quickly folded his option from the small blind. The board ran out [2d] [4c] [2h] [Kd] [9c] and Muhammad doubled to well over 250,000. Wong was left with only 48,000. "Thank you" Muhammad said with a smile as he raked in his new chips. Being level headed is very important in being avsuccessful poker player. For most people busting out of a tournament early can be rather frustrating and put you on tilt. That is not the case for Ralph Macri and Je Wook Oh. 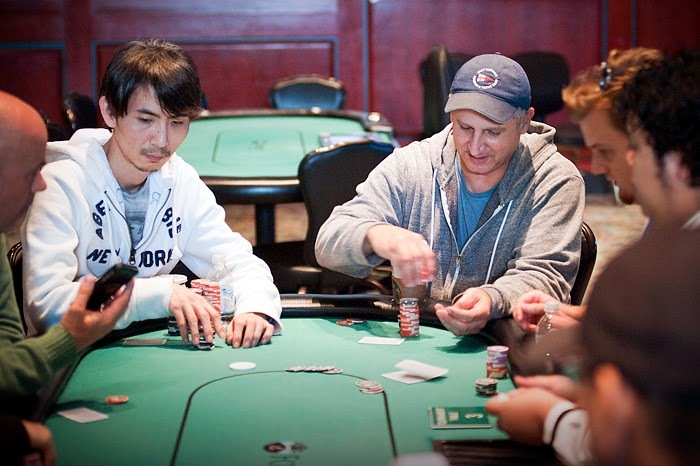 Macri and Oh are among the chip leaders here in event 13 and both are also in the tournament for two buy-ins. Macri currently sits with around 60,000 and Oh is sitting on a stack of over 90,000. The 90 remaining players in event 13 are now in the middle of a color up break. With registration open for only another 16 minutes, the board reads 122 entries for the first flight of this $100,000 guarantee. Players will be playing until the end of level 15 tonight, and flight 1b will be tomorrow morning at 11am. 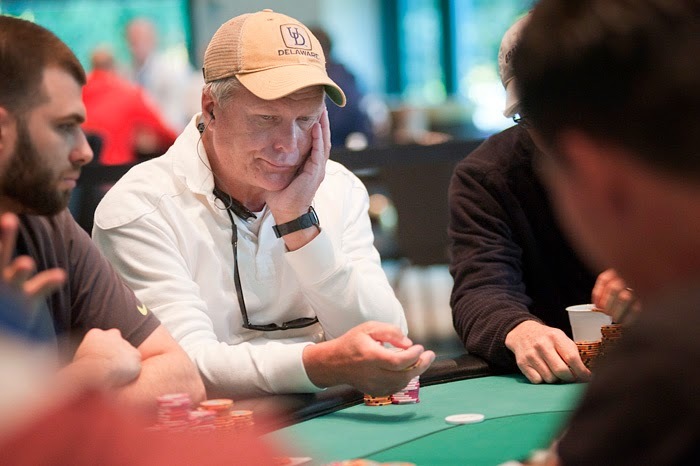 Nick Palma opened the action with a raise to 10,000 from the cut-off and action folded to the big blind who re-raised to 30,000. Not to be deterred, Palma announced all-in as he pushed forward a stack of red 5,000 chips. The big blind went deep into the tank only have 58,000 behind. "Just fold man, you don't want to go out on the bubble," exclaimed Palma. Eventually the big blind slid forward the rest of his chips and the hands were tabled. The board ran out a clean [Jh] [9c] [Js] [2c] [3c] and the bubble was burst. Palma now sits with over 370,000 and we are now in the money! The 15 remaining players are all going home with at least $3,462 but they all have their eyes on the $46,403 top prize. We are currently playing hand for hand in event 12. With only 16 players remaining, the final 15 will lock up a guaranteed min-cash of $3,462 if they can avoid being the next elimination. We will post updated chip counts once we reach the money. We are down to 94 players from the 118 entries so far in event 13. Players will play out the remainder of level 7 and then level 8 before heading on a 15 minute color up break. Here are a few chip counts from around the room. You have until the end of level 8 to register/re-enter! We are down to the final 18 players in Event 12 which means players are currently on a 15 minute break and will be redrawing for a new seat when we return from break. With only 15 players making the money, we are only a few eliminations away from hand for hand play. Players are on their first 10 minute break of the day here in event 13. The board currently reads that 91 players are registered. You have until the end of the 8th level to register/re-enter! When players return the blinds will be 100/200/25 ante. Bobby Riccuiti opened the action with a raise to 6,200 from under the gun and was called by She Lok Wong on the button. 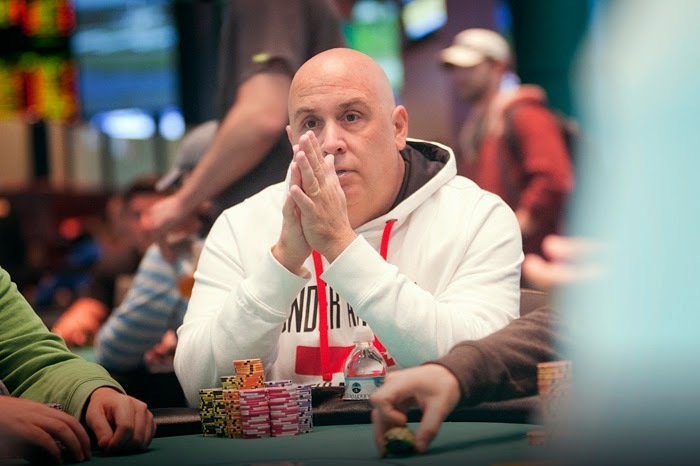 Brian Altman announced that he was all in from the small blind for a total of 30,500 and Stephen Chiovaro let out a sigh from the big blind as he was visibly frustrated. After counting out a call and the rest of his chips numerous times, Chiovaro eventually folded and Ricciuti put in a reraise to 58,000 total. Wong released his cards from the button and we were heads up. The board ran out [Ah] [Ks] [5c] [9s] [2s] and Altman was sent home just 6 spots shy of the money. 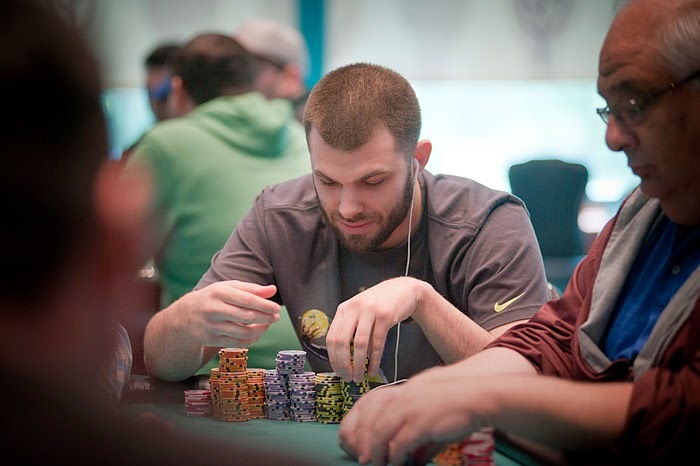 Ricciuti now sits with well over 350,000 and is still the top stack left in the field. Action folded around to Julio Martini in the cut-off and he opened the action with a raise to 7,500, only to be three-bet by Nick Palma on the button to 16,000. The blinds got out of the way and Martini went into the tank. After about a minute Palma removed one of his headphones. "Did you fold yet?" Asked Palma with a smile. The two continued with banter for another 2 or 3 minutes before Martini eventually folded. We are officially under way on day 2 of the $1650 NLH event. 119 players took their shot yesterday and after the last hands of the night we were left with 24. There are plenty of notables left in the field including two east coast pros Nick Palma and Justin Adams. Palma has amassed over $230,000 in lifetime earns and has 1 Foxwoods title to date. 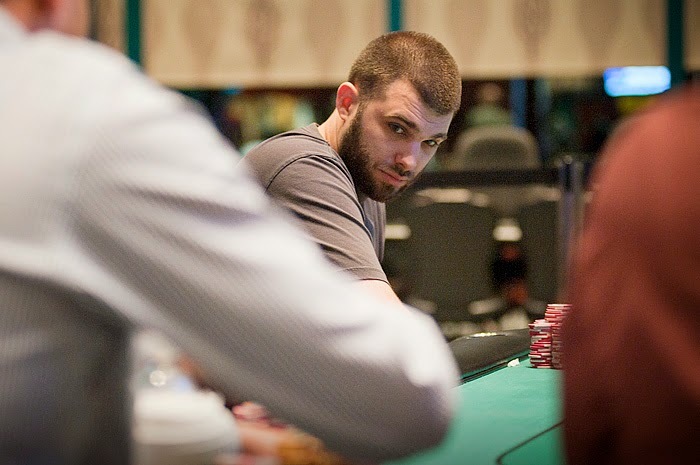 He most recently finished 2nd in event #2 of this years World Poker Finals good for $19,556. He will definitely be one to watch as he comes into today among the top 10. 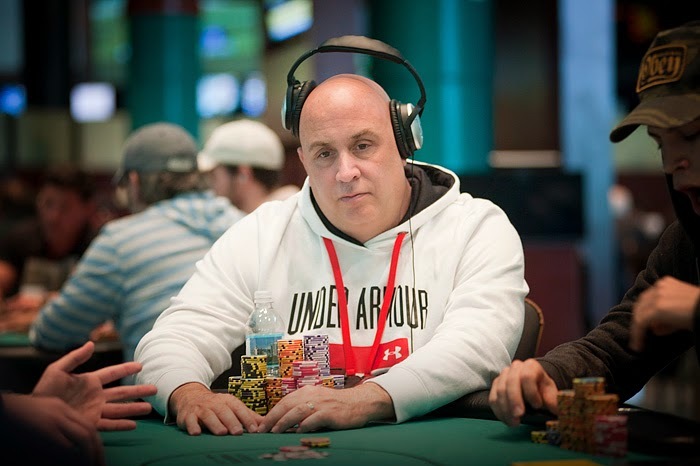 Leading the way is Bobby Ricciuti who is also no stranger to the Foxwoods scene. Bobby has over $190,000 in life times earnings and is looking to add an additional $46,000 to his stats with a 1st place finish today. Players have until the end of the 8th level to register and take their shot at the $100,000 prize pool! Cards are in the air for Event 14. Today marks the first of two starting days, with Day 1b on Monday Oct. 13th at 11am. Players have until the end of the 8th level for registration/re-entries. There is also a $1,000 bonus to the chip leader at the end of both day 1 flights, as well as $500 to the second largest stack. Follow along with the updates at www.foxwoodspoker.com ! With 10 minutes left on the clock, the tournament staff has drawn a card and the field will play three more hands before completing play for the night. There are currently 24 players remaining, and the ones that survive will return at 12pm to play down to a winner.